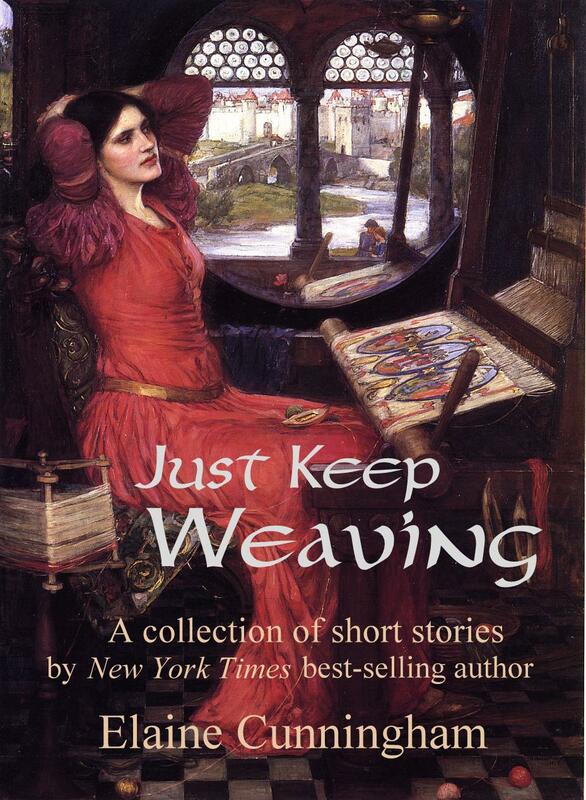 Just Keep Weaving is a wonderfully eclectic collection of short fiction from Elaine Cunningham. The 12 stories range from Arthurian legend, to Adam’s first wife Lilith, to a nautical ghost story. There is something for everyone between these pages and the only difficulty that I had was choosing which one I enjoyed the most. Many of these stories have appeared in various anthologies and Elaine’s website. Many of the stories had a rather dark tone to them, which I really enjoy. Elaine is able to convey many complex emotions in few words. Here are the stories and a brief opinion of each. Trophy Wife – Lilith, Adam’s first wife, is still plying her trade and taking her revenge on the son’s of Adam, this time as a divorce lawyer. Ravens – I enjoyed this story because the character reminded me of John Connolly’s Charlie Parker. Sometimes the bad in you brings out more than just the bad in others. Dead Men Tell No Tales – This was an interesting pirate themed ghost story with a nice twist. There was a sense of tension that built throughout the story. Lorelei – This was one of my favorites. A very dark tale about war, leadership, and temptation. Knight of the Lake – The first of two Arthurian tales in this collection. I enjoyed the crossover of Arthurian lore and the realm of Fairy and how Lancelot began his training. Hidden Blades – The second of the Arthurian tales, told from Gwenhwyfar’s point of view and introduces the Lady of Shalott. Burning Bright – While this story was not my favorite it had the most unique point of view, from a cat. Jack and Jill – An interesting piece of murder mystery flash fiction that gives an interesting twist to the original nursery rhyme. Maintenance – Another piece of flash fiction that suggests that youthful looks is not always a blessing. Juniper – Another of my favorites primary because it deals with elves, but the elves in this story are much darker. The Princess and the Psotnik – A psotnik is an elf or “mischief maker” in Polish folklore. I would love to read more about the characters in this story. I think it would make a great full length novel or at least a novella. She Who Is Becoming – This story combines Celtic and Nordic myths and asks the question, “what do we decide, and what is decided for us”. I highly recommend this collection, especially to readers of Elaine’s previous works. I loved the varied themes and I want to track down the various anthologies that many of these stories were originally from.